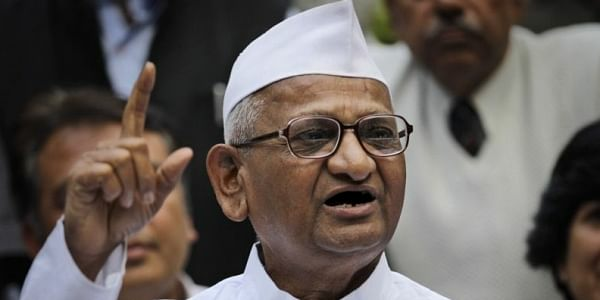 Anna Hazare has alleged that the Narendra Modi-led government at the Centre weakened the anti-corruption Lokpal Act. KHAJURAHO: Social activist Anna Hazare has alleged that the Narendra Modi-led government at the Centre weakened the anti-corruption Lokpal Act. "Former prime minister Manmohan Singh rarely speaks, but he had also weakened the Lokpal law (when it was framed). "Modi has further weakened the law by presenting an amendment in Parliament on July 27, 2016 through which a provision was made that relatives of (government) officers including wife, son, daughter and others will not have to submit details of their properties every year," Hazare said, talking to reporters here last evening. The anti-corruption crusader was here to take part in a three-day `Jal Sammelan', a convention of water conservation, which concluded last evening. "As per the original law, it was mandatory for (government official's) family members to submit their property details," Hazare said. "The amendment bill was passed in the Lok Sabha in just one day, without any debate. It was introduced in the Rajya Sabha on July 28, and on July 29 it was sent to President for his signature. The law...was weakened in just three days," he said. Hazare, who recently announced an agitation in the national capital on the issues of Lokpal and farmers' problems on March 23, said he had written several letters to prime minister Modi on various issues, but never received any reply. Talking about the agrarian distress, Hazare claimed that as per a 1950 act, compound interest cannot be levied on crop loans, but banks charge the same nonetheless and the government is not doing anything about it. He demanded that farmers above the age of 60 should get a monthly pension of Rs 5,000.